The compliance date that requires a municipality to implement and continue using an assessment or management method that is designed to maintain regulatory and warning signs retroreflectivity at or above the established minimum levels is June 13, 2014. Rather than having specific dates as previously published in the MUTCD in regards to replacing signs that are non-compliant, the new rule allows for municipalities to prioritize replacements suited to budgetary demands. 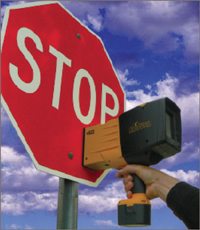 The elimination of compliance dates DOES NOT eliminate the requirement that signs meet retroreflectivity standards. The use of upper/lower case letters for road name signs remains a mandate. The use of larger 9” signs with the appropriate letter heights where speeds exceed 30 MPH also remains a mandate. This upgrade is required when replacement is necessary due to signs not meeting retroreflectivity standards, theft and other applications that require new signage.